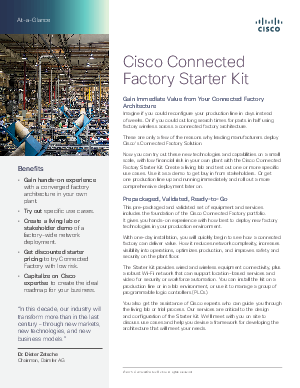 Try this attractively priced starter kit that offers everything you need to connect, secure, and analyze your manufacturing floor, so you can evaluate the benefits of a connected factory before launching factory-wide. The kit includes specified hardware, software, and services. Complete the form to let Cisco know you want to learn more.